The following image is the layout diagram for the Slink OmniHUD version 3. This HUD is more streamlined and simple than V2. All the options are on one single page, no more tabs and different pages. the RGB button to obtain the current RGB value of your feet for safekeeping or transfer into another HUD. the space between the skin textures and the logo will contain style specific options where they exist. the resize slider. Click towards the large end to make the feet bigger, towards the small end to make them smaller. Reset sets them back at the default 100% that they are packed with. the favourites section. There are 4 positions for you to save favourite options in this HUD. Press “save” to save a colour (NOT the dollop above save), and then press the coloured dollop to retrieve your saved colour. Make sure you note what skin texture you used, so you can retrieve that in the future. 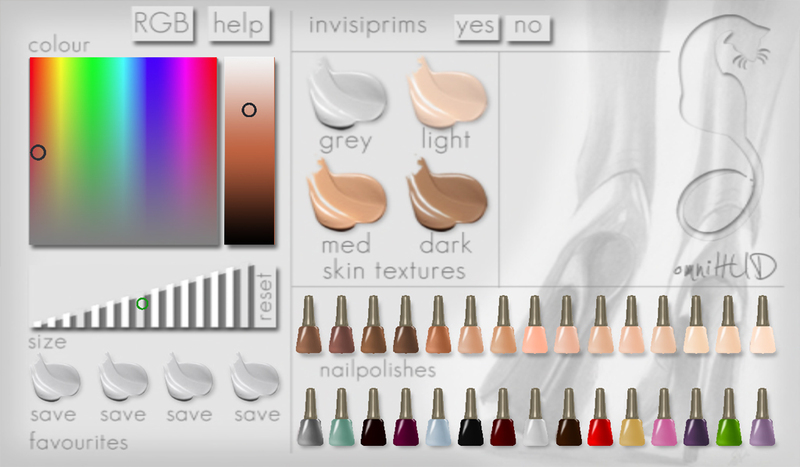 The nailpolish buttons – there are 15 natural tones, and 15 polish tones to choose from. 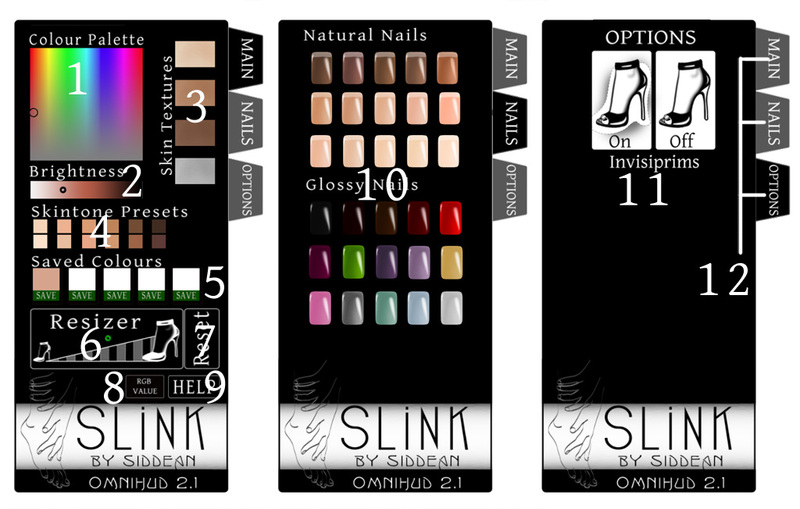 Extra nail HUDs can be bought separately from the Slink store. The following image is the layout diagram for the SLink OmniHUD version 2. Saved colours. Press the green SAVE button to save your current foot colour to the favourites. Press the coloured square to tint your feet with that colour. The resizer bar. Click to the left of the green dot to make your feet smaller, click to the right to make them bigger. The reset button. Resets your feet to factory default size. Does not effect colour, texture, or toenails. The get RGB button. Displays the current RGB value of your feet. Handy for easy tinting of non-SLink feet. The help button. Press this to open the Slink Help Pages where you can browse the FAQ’s, and learn more about SLink products. The options page. Here you will always find the toggle buttons to turn off the invisiprims, as well as other options that may be available with the style you are wearing, such as closed toe boots, toggle buttons for fullbright, shiny, pawpads, socks and stockings where available. The navigation tabs. The active tab is black. To navigate to any other area, simply press one of the grey tabs to activate that page of the HUD. Can you enter an RGB value directly? My viewer shows me the RGB of my skin – is there anyway to enter those values into the HUD? I have the beige lulu stilettos and i’m clicking yes to turn on invisiprims since something I’m wearing needs an alpha. The invisiprims aren’t coming on as I still see my regular avatar feet. Any advice? Please contact me inworld for an update of this product. I keep getting these messages in local chat when trying to change my RGB: SLink Jolie Nails Tinting HUD v1.0: Changing your skin to the RGB values you specified. [15:04] SLink Jolie Pied OmniHUD V 3 Lulu (WEAR ME): Changing your skin to the RGB values you specified. [15:04] SLink Jolie Nails Tinting HUD v1.0: ERROR: Was asked to change chat_input but can’t find how to. Please let the creator of this item know they forgot to tell me!. I have tried using the suggested method of: /13 skin 230,175,137 after inserting my skin’s RGB in it’s place. I bought the chubby pack and am getting peeved. Help, please. Hi Sookey, I have contacted you inworld about this, but incase anyone else is reading with the same issue – the message is coming from your Nails HUD which doesn’t understand the command.. “SLink Jolie Nails Tinting HUD v1.0: ERROR” The instructions for listening to the /13 command are not included in the nails HUD script. You can either ignore the error, or detatch the nails tinting HUD before using the /13 skin command. No, there is only one script per foot that controls the functionality and one that controls the ankle animation which would mean that the ankles would break and you would never be able to change the toenails on the completed set. The scripts are not resource heavy, they are only active when the HUD sends them a command. hi, i have bought the SLink Jolie Pied Barefeet Low omnihud v2.1 a few years back, i like them alot but i never could get the color right for my ava. these days i see that in other footstores they give a socks with the package that is called ‘ankle blender’. my question is if you have such a thing for my feet, or maybe an update of the whole package! ?